A few weeks ago after Doom Patrol #2 came out, the kid and I wound up discussing it at the kitchen table. The comic book is loosely connected to one of our kids' favorite cartoons, Teen Titans. (For those not in the know, Beast Boy, a member of the Teen Titans, was originally a member of Doom Patrol). No. 1: "Who's this guy?" "That's negative man, you remember from the Teen Titans?" "That's not Negative Man. That looks nothing like him." "'Cause he's not wearing all the bandages?" Turning to the page with the negative men statues featuring the bandaged mummy wrapped look, "How about this?" "Yeah, that looks like Negative man. Why doesn't it look like Negative Man in the other places?" "Look at the last page of #2. What's it have on it?" "A parade with a bunch of toys." "What if it's all happening in a little boy's imagination? Would that make sense of all the differences?" "Yeah, that would make sense.... It says it's Danny Land!" No. 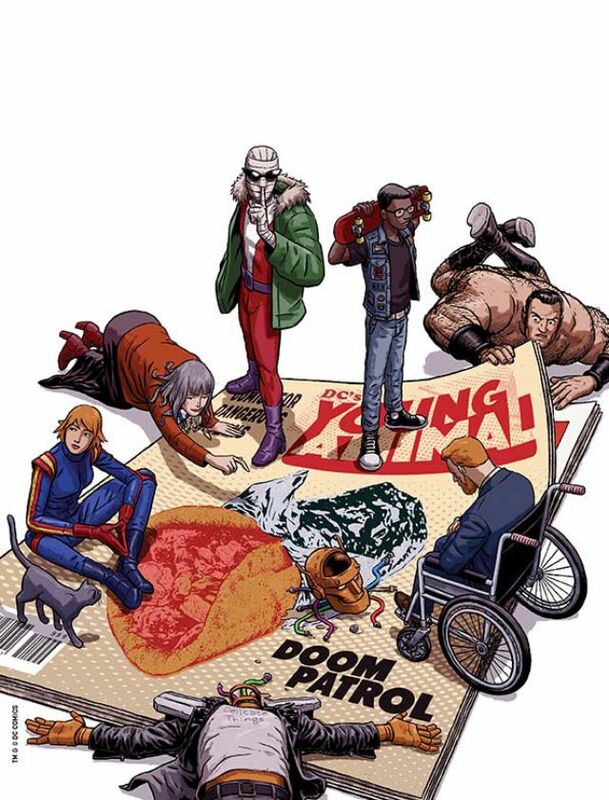 1 grabs the first Doom patrol issue, and flips through the pages. "Look at this!" She shows me a frame featuring a character screaming "Danny!!!" near a pile of bricks. This is followed by several minutes of finding other Danny references in the two issues. I then mention that it makes sense of Robot Man's brain being in a cat dish if it's all pretend. A discussion ensues as to whether the cat is drinking water, or merely licking Robot Man. This is followed by a more heated discussion about whether the garbage truck hit Robot Man, or he attacked it. No. 1: "He staggered out of the alley, and hit the garbage truck." "Hunh, that could've happened, but how'd his leg get under the side if he hit it? "He hit it so hard that his leg flew up, and then fell under." "What if the truck had swoosh lines? Then would it have hit him?" "Yeah, then it would be moving, and it would have hit him. See, it's not, so he hit it." "Oh my gosh! Look what's in the back of the truck!" A few minute discussion of foreshadowing and the big DannyLand reveal at the end of #2 ensues. The kid then flips over to a meeting of 'space aliens,' and points out that the people in business suits are the "same kind of aliens that attacked Robot Man," something I hadn't put together. She then notices that the product they're talking about is Danny Burger. All this is capped off by a bit more page flipping, and finally finding a brick in the last scene of #1 with the name Danny scratched into it. There are way more references to Danny in Doom Patrol in #1, and #2 than I had realized. Swoosh lines make all the difference. This unschooling stuff is awesome!